Personally I recommend the FREE Metronomy DJ set @ Rough Trade East 7pm on Tuesday. 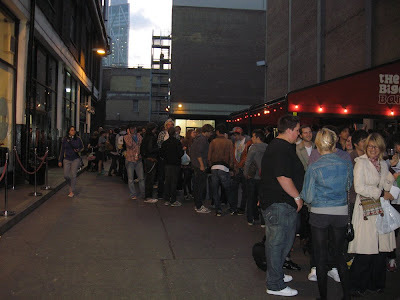 This promises to be a great evening but if you're thinking of popping along I highly recommend you get there as early as possible, the last time they played @ Rough Trade the queue was round the corner and up the street and then around another corner, here's a photo as proof! I never made it in to this show because I'm too much of a grump to stand in a queue for that long and I won't be heading along to the one on Tuesday @ Rough Trade for the same reason. Instead, this week I'll be digging out my Christmas hat and heading off to see Low @ Koko's to celebrate a merry miserable Christmas show. This is like my equivalent to a Terrible Love Songs Christmas party, much better than all those corporate ones I used to have to go to. I'm also looking forward to seeing the LA based Cambodian psychedelic rockers Dengue Fever @ The ICA on Thursday. Dengue Fever have been drumming up some interest recently with an appearance on the Later with Jools Holland show last week. If you think I've missed a show, please leave a comment. Here's the video for Metronomy's "Heartbreaker" taken from their great second album "Night's Out"
UPDATE: I've just seen that Bushwalla is playing at The Monarch in Camden on Wednesday this week at 8:30pm - guaranteed fun show. Thanks for the add- once I work out how to add links on Blogger I'll return the favour! Sigur Ros should be a good night, hope you have a great time. I'll be writing a review on the Dengue Fever show so stay tuned!